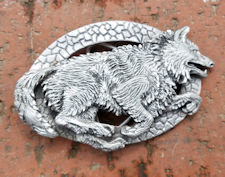 This running wolf diamond cut belt buckle is made in the USA from 100% lead free pewter. There is extraordinary detailing and 3-D dimension in this buckle. The mountains in the background are diamond cut, as are the wolves, and the knots in the birch trees. It looks even better in person than it appears in the photo!